Having been raised in southern West Virginia, Ms. Surface has made New Jersey her home since moving to Morris County in 1998 to complete an externship at a law firm while still attending law school. She parlayed that externship into a judicial clerkship in the Chancery Division, Family Part, for the Honorable Robert P. Figarotta, Presiding Judge, (Retired) Superior Court of New Jersey, Middlesex County. Having clerked in the Family Part, Ms. Surface became keenly aware of the emotional and financial toll that parties face when going through such arduous times in their lives. Ms. Surface has devoted her career to helping clients during what may be some of the most difficult challenges they may face in dealing with divorce and issues relating to support, custody and parenting issues. Ms. Surface has a firm belief that clients should be treated with respect and deserves representation that is straightforward and honest. To the extent possible clients should be adequately advised throughout their representation as to what to expect and not be mislead. Ms. Surface has earned a reputation for excellence in the surrounding legal community. 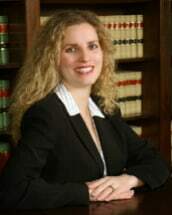 She has been selected as a Super Lawyers Rising Star in the area of Family Law for the past five years. Being a trained mediator, Ms. Surface enjoys approaching a client's matter with the initial perspective of how can she and her client work towards an end goal that is both acceptable to the client and yet agreeable to the other party. While always keeping her client's best interest in the forefront, Ms. Surface is of the opinion that when it comes to resolving issues, people are only limited by their imaginations. Thinking outside the box often results in resolving issues that initially may seem all but one step away from a trial. Ms. Surface volunteers as a panelist for the Morris County Matrimonial Early Settlement Program, with the Morris County Self-Help Resource Center and as a court-appointed economic mediator in family part matters. She has been a strong advocate for her clients, many of whom she has represented during her ten plus hears as part our firm, Heymann & Fletcher.